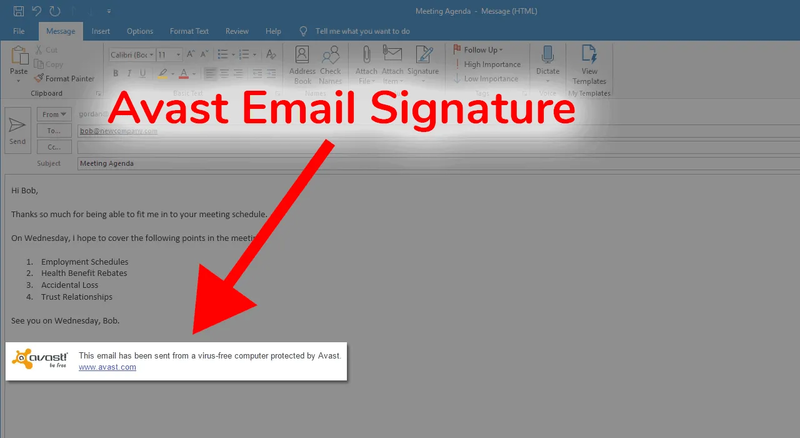 Want to permanently disable or remove the Avast email signature from all outgoing emails? You’ve come to the right place! The message is usually appended at the bottom of all outgoing emails if you’re using Outlook, Thunderbird or any other email client that is installed on your PC. It’s also inserted if you’re using Gmail, Yahoo Mail or any other webmail provider via your web browser. This can be an annoying feature when you don’t want to tell each and every email recipient that the message has been scanned for viruses. 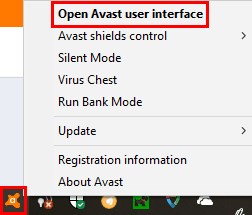 Right-click on the Avast icon in the system tray and click “Open Avast user interface”. Click on Menu in the top right corner, and then click Settings. If you cannot find Menu, you may see a settings style gear or cog icon instead. On the left-hand side, ensure you are in the General section. 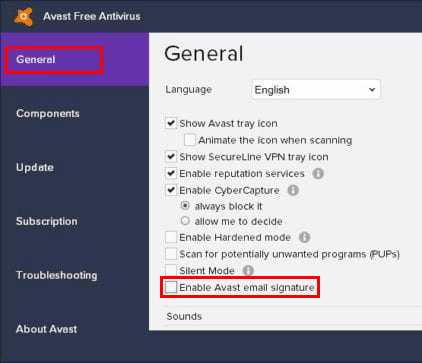 Find the setting for “Enable Avast email signature” and uncheck it. Click the OK button to close out of the settings. Restart your email software and also your web browser. The Avast email signature should no longer be appended to your outgoing emails. Automated email signatures from your anti-virus software such as Avast can be highly annoying. But did you know that having a professional email signature actually increases the response rate of your emails, whilst promoting your brand? We have a free email signature generator which you can use to create your own professional email signature in just 5 minutes. That’s 5 minutes to instantly promote your business with every email you send.